You might think that getting global traffic or building a global audience requires big marketing budgets for translations, localizations, ccTLDs, ads, and other multiple items that involve a middle man (who will want to charge you fees). You can do better than that. The Web is a global sales platform, and the products and services that you are selling have the potential to be very popular in areas outside the U.S. That is if your product is (as it should be): 1) digital, 2) scalable, and 3) distributed globally. I use content monetization engines, such as Amazon Kindle or Udemy Online Courses, for the distribution of my products, so I can reach global markets with zero cost to set up my business operations. For example, people discover and buy my products in Europe, India, South Africa, the Philippines, China, and other locations outside the continental U.S. So it’s very important to me to be familiar with overseas search traffic patterns for keywords related to my business. Here are the step-by-step instructions. Today, 56 percent of my traffic is from outside the US. I’m located in New York, and my website is mainly focused on attracting visitors interested in SEO, growth hacking, and entrepreneurship. But it’s clear that I also have many users accessing from the UK, Canada, India, and Australia. All of these users represent opportunities for any product I develop for an English-speaking audience to reach incremental sales. Here is the data from Google Analytics (you can pull the same report by going to Audience > Geo > Location on the right pane of your GA dashboard). Then, look at your conversion and traffic data to get actionable insights and identify patterns. Which markets drive the highest quality visitors? What actions do these visitors perform on your website? What are the most profitable markets? 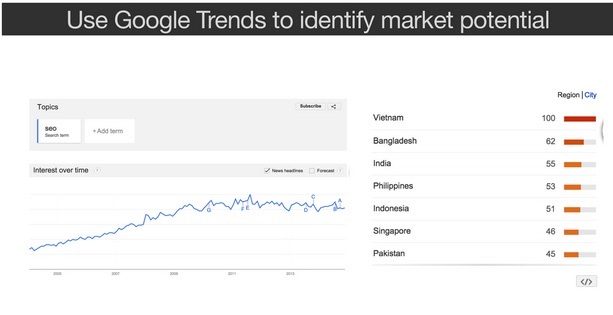 Google Trends is a great place to start crafting your global content marketing strategy. In the example below, you can see that traffic for the keyword ‘SEO’ is high in places such as Vietnam, India, the Philippines, and Singapore. I wrote a book about SEO, so this kind of data is very important to me when it comes to plan my own content marketing strategies and campaigns. 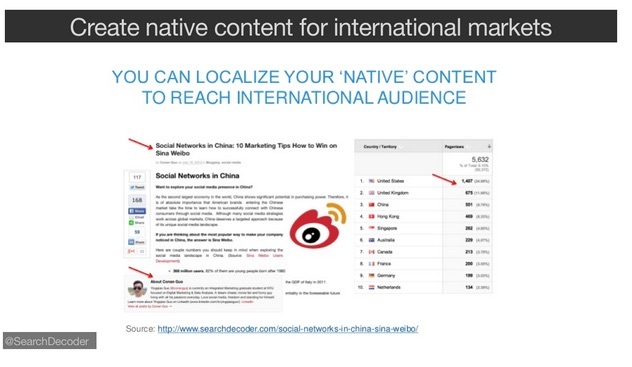 Having an understanding of international search traffic patterns lets you design and create native content (in English) for international markets. Here’s an example: to aid with my own market research, I invited one of my former NYU students, who is native Chinese, speaks fluent English, and has lots of great insights into Chinese social media networks, to write about Sina Weibo, one of the largest social networks in that nation. The author had had no prior experience guest blogging, but he researched the topic thoroughly and provided a lot of value to anyone interested in ‘how to win on Sina Weibo’. The post got nearly 6K page views, only 24 percent of which were from United States, and nearly 300 shares. It also ranked on Google for a long time on keywords, such as ‘Chinese social media.’ Almost 80 percent of traffic coming to this post originated from overseas locations. You can do the same kind of analysis for searches related to any product, service, or content you intend to promote overseas. Then, find an intern or staff member who has international background to create high-quality content targeting niche global markets. 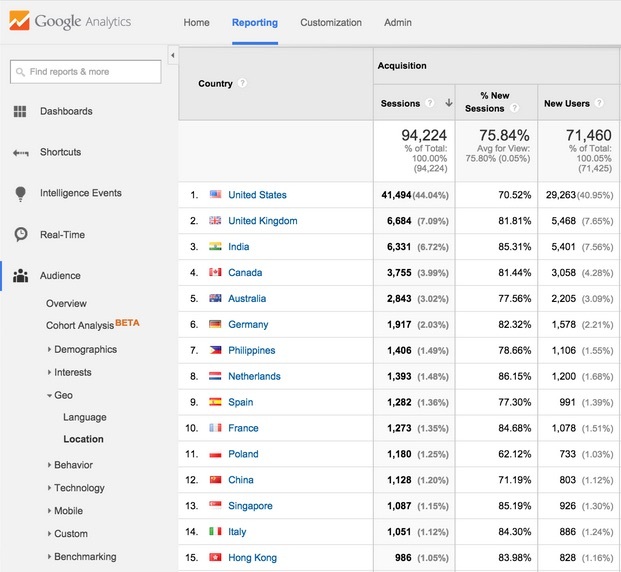 Here’s another great way to develop content that can be a smash overseas: invite influencers from overseas markets where your content has high searchability. 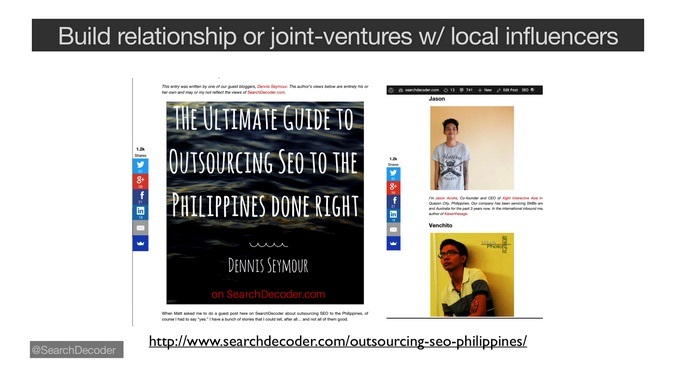 By building relationships and/or joint ventures (such as an ebook or blog post exchange) with local influencers “with boots on the ground” in other nations, you can significantly extend your global reach and potential audience. If you have quality content, people around the world will want it. Focus on solving problems that are cross-boarder in nature and you’ll find that you can reach a truly global audience with your message. For example, one of my best-performing posts on TNW, The Good, The Bad, and The Ugly of SEO, was translated into French and published on a popular blog in France. This allowed my content to reach a much bigger audience, and I got valuable traffic from interested French readers. 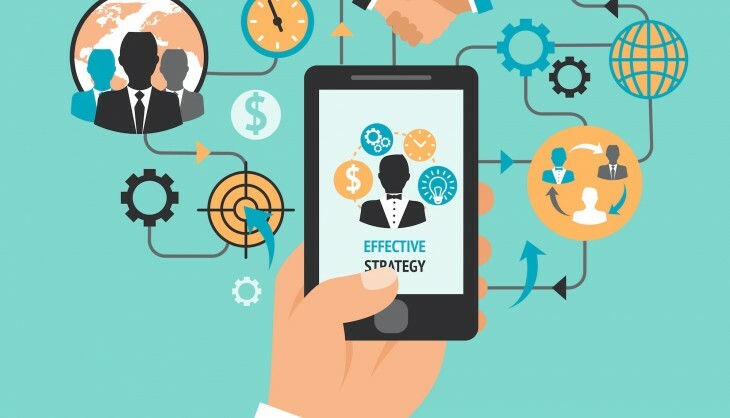 It’s a win-win situation, because your translated content becomes an original content for the publisher, which they can acquire from the author for a translation. If you are bi-lingual, you can do the same if you are a publisher. 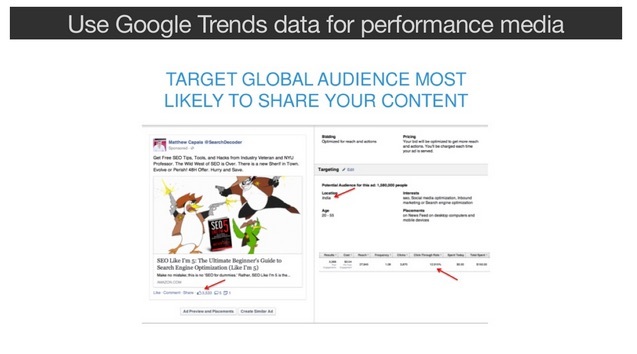 The analytics data described above can provide important guidance for your paid media efforts. I don’t really buy ads on the Internet (I get better results with organic marketing), but I do buy Facebook and Adwords ads when I launch a book or an online course. My goal is always to maximize eyeballs, engagement, and downloads for the lowest possible cost. For example, I recently ran some paid media (Facebook promoted posts) ads for one of my SEO books. I created a couple of geo-targeted campaigns to test performance. The fact that I knew that SEO interest was strong in India led me to decide to experiment with a targeted campaign aimed at the Indian market. I got a 12 percent CTR (Click-Through Rate) on this campaign, which delivered a lot of highly qualified people to the book’s Amazon page, and boosted sales measurably. In comparison, I got 1 percent CTR on the US-targeted campaign. If you live outside the U.S., you can totally reverse-engineer the tactics described above to target US-based audience from where you are. Viljo Vabrit, Co-founder of Markitekt, told me a story about how he and his partner launched and grew (at incredible speed) their conversion optimization business by selling their services to US-based clients. His partner, Peep Laja, started a highly popular blog, ConversionXL, which allowed him to get a massive exposure into the US market, while managing his entire business from… Estonia. He know lives in Austin, TX. Share your thoughts in comments!